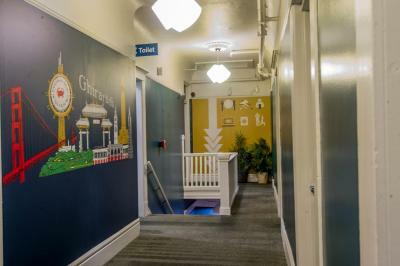 Lock in a great price for USA Hostels San Francisco – rated 8.4 by recent guests! The activities put on by the hostel were great, especially for traveling alone! Perfect way to meet people and have a cheap fun time. Good location, staff were nice especially the young guy at reception. Bathrooms were clean good price especially as San Fran is so expensive! Clean and tidy rooms, clear instructions and felt safe. I stayed in a dorm room with a bathroom- the bathroom was big and clean. Housekeeping came every day to check/clean the room. Staff were very helpful and friendly. Plenty of space in common areas. 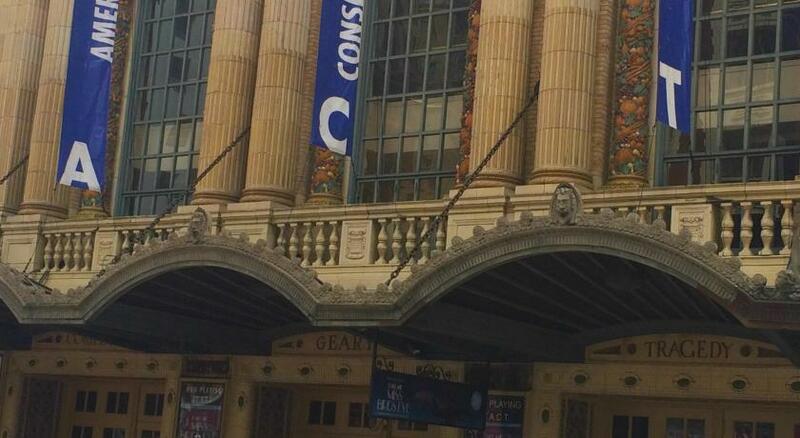 Great location close to Union Square and Powell St bart station. Staff is very nice and will explain you everything. I came here after my stay in the hostel San Diego fort he same party. I loved that one so much (probably the best one I ever stayed at) that I didn't bother checking out other places. This one is clean and has everything you need to facilitate and be entertained, but.. Location close to Union Square. Room, bathroom, kitchen, etc are clean. Coffee and tea always available. We can make our own pancake in the kitchen. Convenience store just across the street. Very clean and comfortable, better than a lot of hotels. Professional run and extremely clean. Large lounge and kitchen areas. Tons of activities if you are looking for something to do. 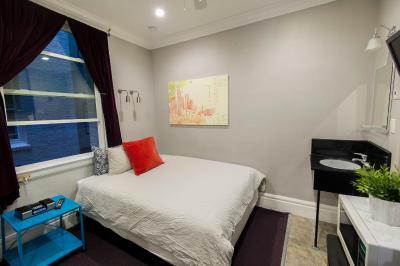 USA Hostels San Francisco This rating is a reflection of how the property compares to the industry standard when it comes to price, facilities and services available. It's based on a self-evaluation by the property. Use this rating to help choose your stay! Offering a daily free breakfast and free Wi-Fi, USA Hostels San Francisco is just 5 minutes’ walk to cable cars and Union Square. 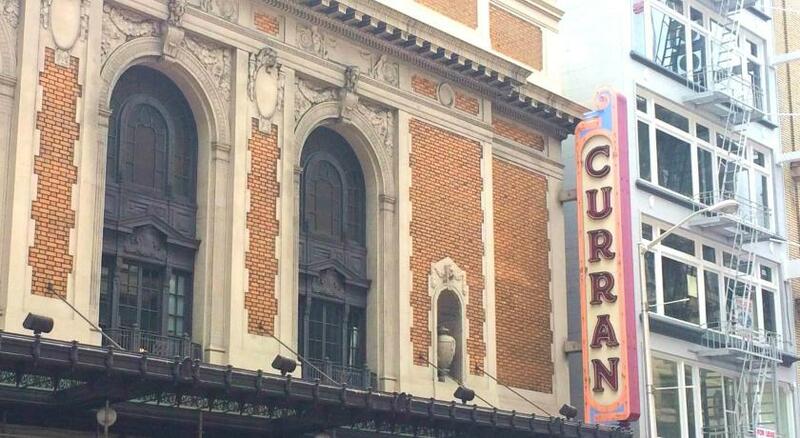 San Francisco’s Chinatown is just 10 minutes’ walk away. 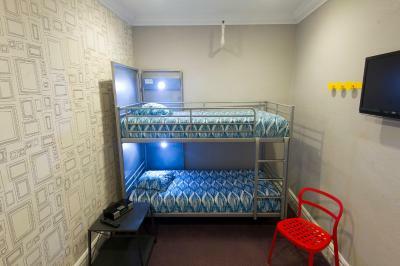 All of the 4-person dorm rooms at this hostel feature Privacy Pods, which include a reading light, a shelf and an outlet along with privacy screening. All rooms include linens. Select rooms offer private bathrooms. A daily breakfast consisting of all-you-can-make pancakes, oatmeal, a variety of baked goods, fresh fruit and juices is served every morning at USA Hostels San Francisco. Coffee and tea are available all day. A 24-hour reception is offered to guests of this hostel. Other facilities include a tour desk, luggage storage and a guest launderette with free laundry powder provided. Guests have access to a shared kitchen, a library, a yoga room and an on-site theater, as well as a large lounge with free foosball and billiards. Guests of this hostel have easy access to buses and cable cars. Japantown is 1.1 mi away. San Francisco International Airport is 12 mi away. A variety of bars and restaurants are within walking distance. 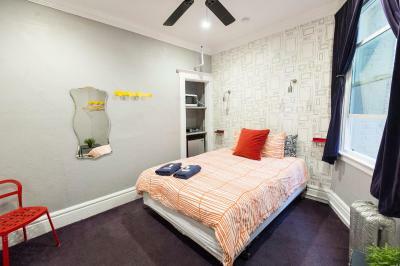 뀐 Located in the real heart of San Francisco, this property has an excellent location score of 8.8! 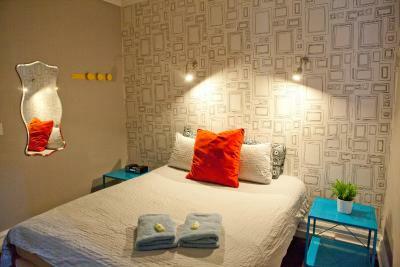 When would you like to stay at USA Hostels San Francisco? This shared female dormitory room includes a privacy pod (shelf, light, outlet), a free locker with power outlets and a full bath in the room. Linens and a towel are included. This room includes a privacy screening with a shelf, light, and outlet. A free locker is provided. There is a sink and mirror in the room. A full shared bathroom is available. Linens and a towel are provided. This mixed dormitory room includes a privacy screen with a shelf and outlet. A free locker is provided. 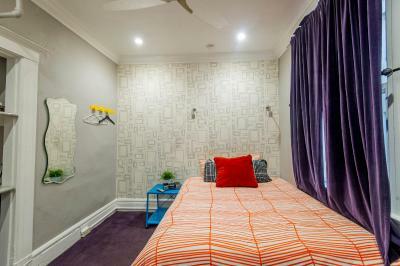 A full bath in the room is available along with linens and a towel. This mixed dormitory room includes a privacy screen with a shelf and outlet. A free locker is provided. A full shared bathroom is available along with linens and a towel. This room is located near the main entrance. Guests may hear more noise. *****Please note: This is not a private room. This listing is for a single bed in a dorm room. 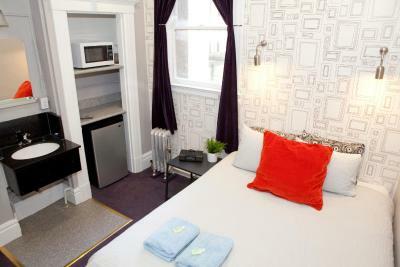 This private queen room offers hotel-like comfort and includes a microwave, a fridge, a cable TV and other amenities. Room includes all-you-can-make breakfast and free daily activities. A full bath is included in this private room. This queen bed room features hotel-type amenities, as well as daily free all-you-can-make breakfast and free daily activities. Full baths and separate showers are near to this room. Offering a private bunk bed, this private room includes a private bathroom, a cable TV and other amenities. Daily free breakfast and activities are provided. This private room features a cable TV. Most of these rooms also have a sink. A shared bathroom is near to the room. A daily free breakfast and activities are provided. Area Info – This neighborhood is a great choice for travelers interested in shopping, city trips and food – Check location Great location - show map Guests loved walking around the neighborhood! House Rules USA Hostels San Francisco takes special requests – add in the next step! USA Hostels San Francisco accepts these cards and reserves the right to temporarily hold an amount prior to arrival. At check-in, all guests must present a valid passport. US residents must present valid government issued identification (driver’s license, state ID card or passport). Please note: Rooms booked under USD 40.00 will be only be subject to 1% tax. 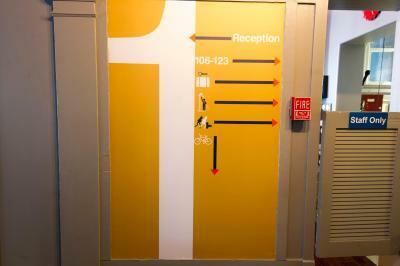 The maximum length of stay at USA Hostels San Francisco is 14 days. Please note: Reservations are limited to 10 people. Multiple reservations of 10 for the same group will not be accepted and 1 guest cannot make multiple reservations for multiple rooms. Beds are very loud / creaky and a little uncomfortable. They were fixing a lot of stuff during my stay. The elevator wasn't working, and they had an issue with the bathroom in front of my room that was making all the hostel smelly. Also I didn't like the fact that you had too clean the dishes you used for breakfast. People aren't to careful of washing them properly and they were still dirty. The cleaning staff were always cleaning the bathrooms (wall-scrubbing cleaning) in the peak times (8-10am), when everyone is trying to find one. Would suggest they only do quick cleans during this time, and save the wall-scrubbing for the middle of the afternoon etc. Nice facilities, good dorms with lockers and individual charging stations. Great breakfast, can make your own pancakes, lots of activities offered. Would stay here again. Some curtains for privacy wouldve been great for the beds but theres at least a small kind of wall which was nice. Shower stalls are TINY, hard to not get everything wet. Staff is wonderful, friendly and super super helpful! Give great tips and recommandations too! The activites organized are really nice too. Location close to transportation but not the safest at night (you do need a keycard to enter the building after 9pm, and I really liked that security). Rooms where a good size with a sink+mirror in it and small lockers for everyone. Not the hostels fault, but the people I shared a room with smelt so I was pleased when they left a day earlier than me so I could air out the room. Also, please just put out whole bananas and don't cut them. A little more of a "young folks" place than other hostels nearby. Toilets could have been cleaner. Room could have been a little colder during the night. No gluten free alternative on the breakfast and the really old and charming heaters where really noisy, luckily it wasn't that cold. The heaters can be a little noisy. Plugs are not working very well. Breakfast is really simple but ok.
Good Place to visit San Francisco, very central. The Hostel was clean and quiet (for an Hostal). The breakfast could be better. I know it’s a hostel but adding cereals or eggs to the breakfast would really make a difference. The beds were very comfy and our room quiet. No lines for the showers! Staff was very friendly and accommodating. The smell on the hallway it's smells like toilet never been cleaned. Exchange rate between pound and dollar is low at present. USA cost of living is generally double ours. Only petrol/gas is cheaper than in UK. Hence poor value rating.